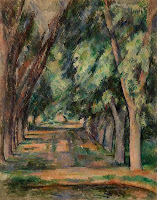 In the previous post, you examined a Cézanne painting, The Allée of Chestnut Trees at Jas de Bouffan. In this post, I will compare that Cézanne painting to one by Edward L. Loper, Sr. In the spirit of full disclosure, however, I must tell you I know Ed Loper. 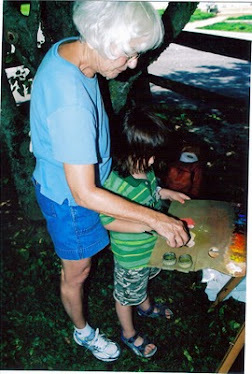 He taught me to paint, he insisted I attend Violette de Mazia’s class at the Barnes Foundation, and I wrote a book about his life and his work: Edward L. Loper, Sr.: The Prophet of Color. Before you read any further, make a list of the differences you detect, and think about what those differences reveal about each artist’s design. 1. The Loper painting makes the Cézanne painting look dull, cold, and dry. 2. The Cézanne painting expresses rigidity, power, weight, order, and massiveness while the Loper painting expresses warmth, glow, iridescence, colorfulness. 3. Cézanne, as I described in the previous post, builds a dynamic relation of planes and solid color volumes in deep space. Cézanne’s picture says solidity, weight, equilibrium, and balance, and you, the viewer, do not feel seduced by the illustrative aspect. 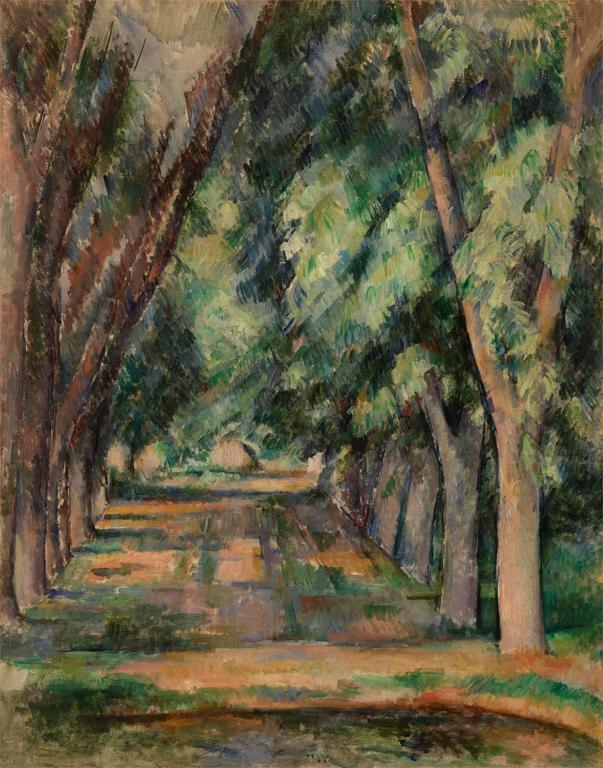 In other words, Cézanne’s picture reveals an austere, abstract composition of opposing forces not an orchestration of the charming qualities of sunshine sparkling through the foliage of trees. Let’s focus on the Loper picture. And you thought you saw similarities between this picture and Cézanne’s, didn’t you? 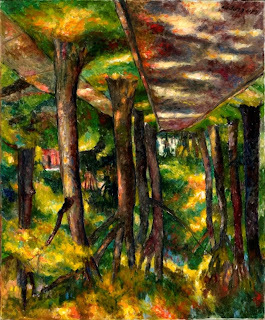 The four slim “tree trunks” now on the right hang from a strip of diagonal patches of viridian and yellow-orange, while the five to the left bend, and curl in an awkward dance in and behind floating tufts of rectilinear strips of cool cerulean blue, orange, gold, and green. The cool/warm contrasts create an in and out pulse, like ripples in clouds. You do see spaciousness, but the space happens in pockets, not in a deep, dramatic push as in the Cézanne. 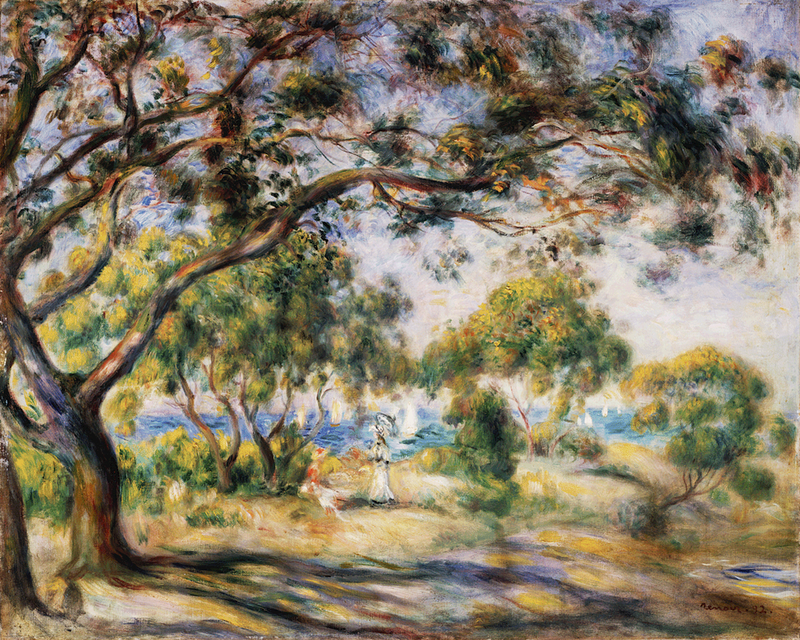 Loper’s picture merges elements from Cézanne and, surprisingly, also from Renoir. I say surprisingly because, when I was studying with Loper, he praised Cézanne constantly, and he never had a good word to say about Renoir. This caused numerous, heated arguments, especially after I had studied at the Barnes Foundation and had some ammunition to bolster my position. As you can deduce, I loved Renoir’s work. Cézanne left me cold. Now that I have studied Loper’s body of work, I can mark the transition from his powerful, dramatic, dark, cubistic and fractured earlier work and his relatively new (the change occurred about 10 years ago) lighter, warmer, richer recent work. The transition happened because Loper derived visual ideas from both of them, and has developed his aesthetic insight through this adaptation. Here are a few examples of the Renoir adaptations. Loper applies color in small dabs—sometimes the dabs are dots; other times they have a boxy, square look. Like Renoir, each color unit is made of multiple colors. The tree trunk enlarged above is built out of dark red, blue, black, green on the left and light pink, ochre, beige, orange on the right. Like Cézanne, a line compartmentalizes the vertical, solid, three-dimensional color unit. Unlike Cézanne, the color unit sparkles and glows, as do the “shrubs” and “foliage” behind it. Those color units of shrubs and foliage look soft as clouds. 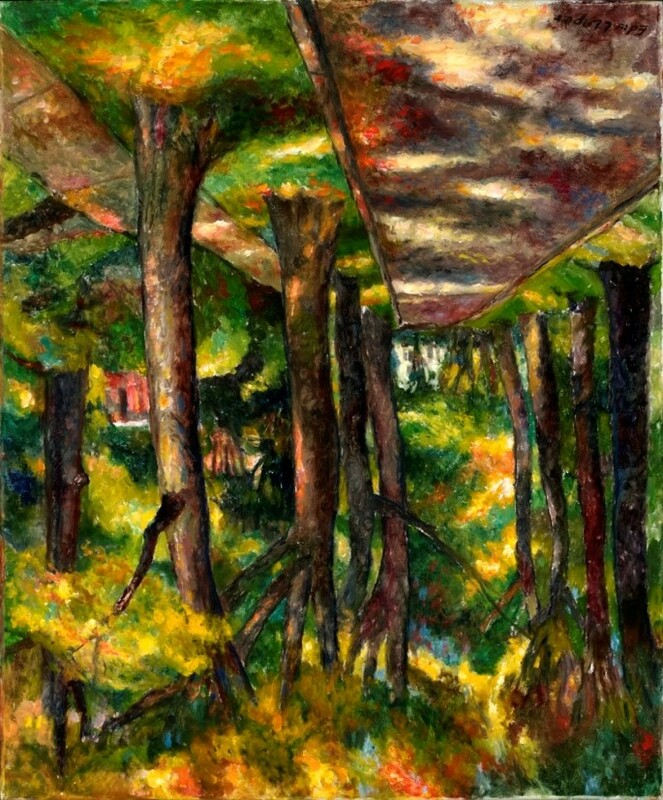 Cézanne’s “tree,” built out of both strips of vertical color bands as well as hatches of strokes, expresses a “pattern” of color units that are more angular than the Loper’s as well as less rich and glowing. Line compartmentalizes the vertical, solid, rigid, units, setting each dramatically separate from the other because of the dark relationships of cool greens and blues between them. Their repeated split branches stand like forked tongs. The “foliage,” constructed out of the same hatched brushwork, moves in and out more like chiseled slate than rippling clouds. They march back in space. You can see the multi-colorfulness of the tree trunk and branches. The paint, applied in pulled ribbons of color, glow and sparkle. The foliage organizes into soft tufts, cotton-ball like in their lightness. Color shimmers from light within. Some outlining of color units occurs, but mostly one color volume flows into another. All the units gently curve. Space recedes because of the peek-a-boo settings of color units and the pushback of the connecting tree units on the left and the right as they join the shadow in the foreground. Consider the following: Loper has merged visual ideas from both Renoir and Cézanne to which he has added qualities that have interested him throughout his long career (he is 95 years old and has been painting since he was 20). During the summer, I will explore Loper’s use of the traditions of art. Understanding the role the traditions play helps us, the appreciators, determine creativeness. Creativeness determines the level of an artist’s contribution. However, in the next post, I set the stage by returning to a familiar question: what is a work of art? Marilyn, It is so wonderful to read about Ed's painting as it compares to both Renoir and Cezanne. I remember the time we took searching for a certian visual quality that we both wanted. We did this painting in 2009, so Ed was 93! Not to do anything but to add to the lore of this painting, but a neighbor that I knew came out to see our progress. 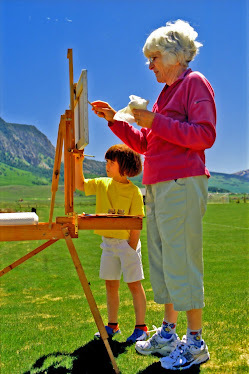 Ed did his usual teaching thing except this time he let the woman actually put a few color strokes on his canvas. Ed left them in so that each day as this woman would come by he could show her how color choices were observed and how well she did. I love how you used the art to illustrate the points, especially by flipping and narrowing the pictures. Very creative! How nice to read your comments. Thank you Tom for providing the context for the making of Looper's painting. Before you introduced me to Loper's painting, Cezanne's "Allee of Chestnut Trees" did not seem either dry or dull to me. After looking at the two paintings side by side, the Cezanne painting literally pales. It appears lukewarm and faded. On the other hand, I find Cezanne's triangular composition captivatingly dramatic, whereas Loper's drama is more in his contrasts - especially between light and dark colors. 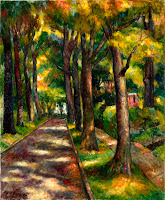 The best way I can describe the two paintings is: Cezanne's painting of the allee is like an imposing gothic cathedral on a cloudy day, while Loper's alley is more like an inviting temple with stained glassed windows in a sunny day. I want to explore them both. 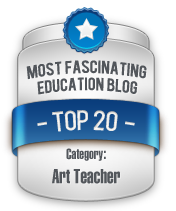 Thank you for your awesome blog! 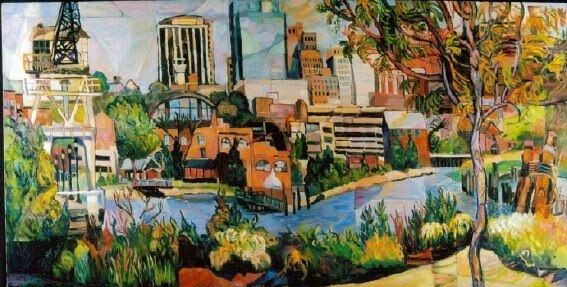 I can stare at a Loper painting for hours upon hours, and the world simply transforms. I can only hope that with his recent passing the world can somehow come to know his later works. So many are in private collections that I fear a true retrospective would be difficult to arrange.